If you have joined this group, and want to contribute to the group gallery WITHOUT having to resubmit your picture, just go into the group gallery, and click "+ Submit to this Gallery". You will be then given two options, those being "Submit a new Deviation" and "Contribute an Existing Deviantation", click the second option and pick the picture you want. You'll have to do this every time you want to submit an existing picture from your gallery. Featured: This is closed to gallery submits. If your artwork is of a VERY high standard, we will put it in here, to show off. Memes: We have a range of Memes being submitted into the ground, and it was hard to place them, so there is now a folder for them. I went searching through the deviant art groups for a group worshipping Gargoyles, and to my horror, there WASN'T a group for that. Join this group if you love gargoyles, and start showing off your lovely pictures. Thank you for taking an interesting in my character and her art. Means a lot! Did any of you knew that the voice actress of Sora from Clan Ishimura died three years ago? I might be a Disney Fan, But 'Gargoyles' is My #1 FAVORITE Disney Show! My favorite gargoyles are Brooklyn and Lexington! And my Favorite Villains are Jackal and Hyena and Thailog! 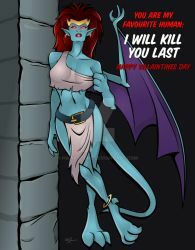 And While I mostly write Disney FanFics, I intend to Include 'Gargoyles' Into them too! And Im even developing a few idea's for 'Gargoyles' OC's and Fics of my own too! And I do Hope You guys do like what I write! Thanks for adding my work. Sorry, until I see it on Greg's blog, I won't be making any announcements about it. There is a troll going around the TMNT groups AND other groups posting awful pictures of a one-eyed Mikey, and other offensive images. The deviant name is Musclesthehedgehog, used to be known as FairyMikeyChurch . This person is twisted, biased, hypocritical, offensive, and rude. When you try reasoning with him, he will claim that you are "tempting him to sin". He's offending the Christian faith, and he is doing this to get attention. I advise you to please report him and his work to the DA Administrators, and hopefully they will do something about it. Please spread the word to stop this. Is anyone still alive on this site? I know the show is like -20 years old-, but that's beside the point. I adore this show with all my being and didn't know if any of the fans here are still around. I'm up for role-plays or chats about the show. I'm also up for collaborations, if anyone's interested! The group is somewhat alive. If I'd realized that yesterday was the 21st anniversary before the day of the anniversary, I might have done a contest or something, but it didn't happen. Something to write on the calendar for next year. Lots of the fans are in their 30s, with jobs and kids and stuff, so RPs are few and far between anymore for time reasons, but we always welcome new friends.